We’ve suggested the spiritual gifts of discernment, faith, and/or wisdom for financial consultation and the gifts of administration, helps, and/or service for financial management. What about the spiritual gift of giving? 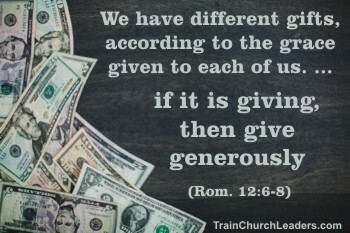 This gift has an obvious connection to church finances so we should make some observations leaders need to keep in mind. The spiritual gift of giving has more to do with the actual giving than the handling or managing of funds. Just because a person has this gift doesn’t mean they should be on the finance team. They aren’t necessarily the ones to call upon for financial consultation or management unless they also have other appropriate gifts. All believers are instructed to give to the work of the Lord but those with the gift of giving will tend to give over and beyond the tithe. Don’t expect people with the gift of giving to bear the burden of the bulk of financial needs. If God uses them to do that, fine, but all believers have a part. You shouldn’t have to, nor should you, manipulate, flatter, or coerce people with the gift of giving, but should trust God to direct their giving. Present needs but let God move them to use their resources. Don’t make others in the Body feel guilty because they aren’t doing as much as someone with the gift of giving. God has given people with this gift His special divine empowerment to use their resources generously and often sacrificially. The standard for those without this gift is to give “as God has prospered” them, in accordance with their income (1 Cor. 16:2), the Old Testament standard being a tithe (Mal. 3:10–12). The standard for those without the gift is not comparing them to those with the gift. People with the gift of giving often want to give anonymously. They don’t need recognition. Even though you might be overflowing with gratitude, direct your praise to God and respect their desires, keeping their confidence.